Nightlight’s Peru adoption program was put on hold in 2015. Though we have a wonderful history of adoptions from Peru, we recommend families pursue one of our other programs at this time. The Peru Adoption Program is run by our affiliate office A Helping Hand Adoptions. The Republic of Peru is a country in western South America. It is bordered on the north by Ecuador and Colombia, on the east by Brazil, on the southeast by Bolivia, on the south by Chile, and on the west by the Pacific Ocean. Spanish is the primary language of the country, 80% of Peruvians speak the language. It coexists with several indigenous languages, the most important of which is Quechua. Due to poverty and high birth rates, there are many children in Peru who have been abandoned or live on the streets. The numbers are staggering, as hundreds of thousands of children are in need of a permanent home. Peruvian adoption is an excellent way for families and single parents alike to add to their families and provide a child a loving home. Peru is party to the Hague Convention on Protection of Children and Co-operation in Respect of Intercountry Adoption (Hague Adoption Convention). Therefore, all intercountry adoptions between Peru and the United States must meet the requirements of the Convention and U.S. law implementing the Convention. AHH began its work in Peru as a participant in the Waiting Angels program. The Waiting Angels program consists of children who are harder to place such as children with minor and major medical special needs, children 5 years and older, and sibling groups. Prospective adoptive parents have the opportunity to choose to be matched with specific child/children off of the Waiting Angels list. Both boys and girls are available for adoption. Children as young as two years old and as old as sixteen are available for adoption. Applicants must be at least 18 years older than the child they are adopting and no more than age 55, with some exceptions. Applicants must be married for at least one year. Both married and single applicants may adopt from Peru. 1. Make application to A Helping Hand Adoption Agency. 2. Begin your adoption home study and submit form I-800A to CIS. 3. Begin to assemble your dossier. We will give you detailed instructions. 4. Once CIS has approved your adoption home study, you will receive your I-797C pre-approval notice. 5. Once your CIS approval has been received your dossier is complete, you will be registered to adopt in Peru. 6. MIMDES will add you to a list of waiting families and it can take 3 to 6 months to receive a referral. 7. Once you have accepted your referral, we will begin the I-800 process with USCIS. 8. You will then travel to Peru to receive your child and attend court. 9. The final step is to obtain the US visa for your child and returning home. Most families will remain in Peru for 23 to 29 days for the adoption process to be completed. 10. The children reside in orphanages while awaiting adoption. 11. Peru adoptions can take on average from 9 to 12 months to complete. You receive a referral of a child from A Helping Hand Adoption Agency through MIMDES. The referral will include a brief social history of the child, the current health and development of the child, and photos. We highly recommend that you have this information reviewed by a doctor who specializes in international adoption before you make a decision. Once you decide to accept a referral, you will be considered “matched” with the child. We will then begin the I-800 approval process with USCIS before you travel for court. You will travel to Peru to receive your child and attend court. The final step is obtaining the US visa. Most families remain in Peru 23 to 29 days. Both parents need to be present for initial bonding and to attend the court hearing. Aside from those events, it is possible for one parent to leave while the other remains in Peru. Within 30 days of your arrival home, you must have a home visit by your home study provider. Your home study provider will prepare post-placement reports and submit them to A Helping Hand every 6 months for the first 4 years after the adoption is finalized. These reports include your child’s developmental progress and pictures. This is a very serious commitment; AHH is committed to showing the MMDES and birth families that children adopted by US citizens are healthy and well cared for. Compliance with post adoption reports is also required by the Hague Convention. Therefore, AHH charges a fee to monitor and process these post placement reports and also requires families to pay for the cost of the post placement report in advance. 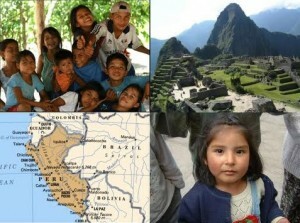 The program fee for a Peru adoption is $12,400. Additional estimated expenses of $13,819-19,119 will bring the total cost to approximately $26,219-31,519. In addition, your out-of-pocket expenses may further be reduced if you receive scholarships or other employer-provided adoption benefits. Complete a preliminary international application to begin your adoption journey! To learn more about adopting from Peru, you may contact us, call our affiliate office in KY at (859)263-9964, or directly email our Peru coordinator, Maria Kovaleski, at Maria@worldadoptions.org.